Decorating is such a personal thing. So, how do you plan a room makeover for a person you’ve never met, can’t ask any questions to, and have no idea what type of personality they have? Well, I’m here to tell you it’s possible. After 30 weeks of baby #2 flipping and flopping around inside my belly I am convinced this little girl is going to be my wild child. She is in constant motion and will punch, kick, and wrestle inside me for HOURS. I’ve decided she’s going to be a crazy little one. After my dream first child who is the sweetest and slept 10+ hours straight in her crib from around 2 months old, I’ve mentally prepared myself for a crazy go at things this second time around so I wasn’t surprised when she started making me nauseous in the evenings from so much movement starting around 15 weeks. Clara’s purple giraffe nursery was sweet, sophisticated, and fit her perfectly. So with that in mind, I am so excited to share with you the inspiration board I’ve come up with for baby #2. 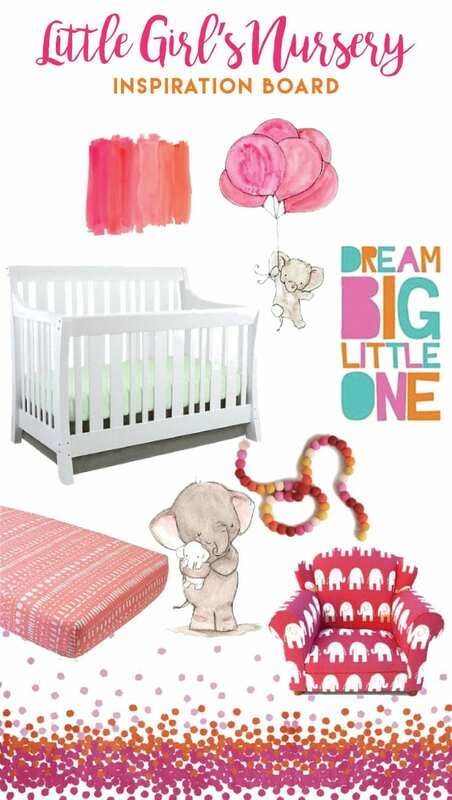 For baby #2 I envision a colorful nursery filled with bright pink and orange. It has the perfect combination of fun and cute with watercolor elephant prints filling the walls and stuffed elephants. Vibrant colors and bold prints fill the room with a large gallery wall above the dresser. I am so excited to get started on this room makeover just in time for baby #2 to join our family by Christmas. In case you love these products as much as I do and want to get them for yourself, I’ve included affiliate links for your convenience. Click here to read my full disclosure policy.